Every time the stock market sneezes, hiccups, or God-forbid vomits, all the pundits start comparing this time to the Great Depression. “Things haven’t been this bad since the Great Depression.” You start to hear it so much you kind of get a little numb. So I’m going to see how the worst financial crisis in my lifetime, the financial crisis of 2008 (diminutively dubbed the “Great Recession”) compares to the big boy. 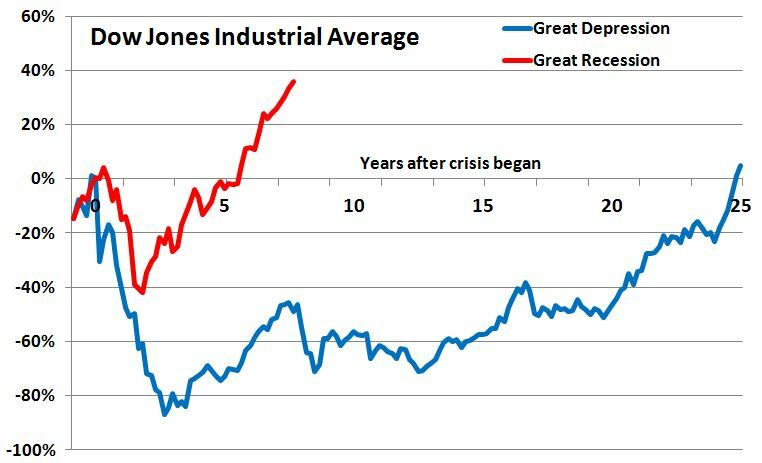 Just a quick history lesson: Great Depression–Like in so many examples before and after, post World War I prosperity and an expanding economy led to increases in the stock market which led to increased stock market speculation in the late 1920s. Confidence had been shaken in September 1929 by a fraud scandal in England, causing the US market to swing wildly up and down over the next month. On October 24, 1929, the stock market crashed 11%, setting off a chain of events that led to the Great Depression. So here you have the gold and silver medal winners in the “Worst Financial Crisis in the US Since 1900” event. How do they compare? You know how they say a picture is worth a thousand words? That kinda puts it in perspective for me. Both had crazy steep falls, with the Dow Jones Industrial Average losing about 40% in the first two years of the crisis, but that’s where the similarities end. In the Great Recession things turned around pretty quickly, while in the Great Depression stocks fell another 40%. At the Great Depression’s nadir stocks were down nearly 90% from when things started. Imagine that for a minute. Today the Dow is at about 18,000; imagine if by 2017 it got down to 2000. I’m not sure we can really comprehend that. As crazy as the falls were, the divergent stories of the two recoveries seems even wilder. 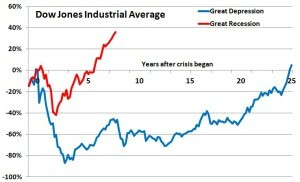 For the Great Recession, the Dow rebounded almost as quickly as it had fallen. It took only about two-and-a-half years to recover from its trough to its starting point. Then it didn’t stop there; as of this writing it was up about 40%. Think about that for a second. As bad as the Great Recession was, today we sit as far above where we started we were down at its depths. But it’s a totally different story with the Great Depression— it was a long, long grind. After the Dow hit bottom, it pretty much lingered there for about 20 years. TWENTY YEARS!!! Twenty years after the Great Depression started, stocks were still down 50% from their highs!!! I feel I’m using too many exclamation points, but I feel they’re necessary. Seven years after the Great Recession the Dow was up about 40%. And I’ve just been looking at this from an investor’s point of view. The Great Depression had brutal unemployment that maxed out at 25%; to put that in perspective, the Great Recession’s worst unemployment rates were about 8% and everyone was freaking out. The Great Depression caused immense human suffering all over the world and played a central role in bringing about the greatest tragedy in human history—World War II. All that stuff makes the Great Recession look like a paper cut. So I propose a new rule. From now on, when stocks take a dive, no one should even try to compare the latest financial crisis to the Great Depression. Just the same way no basketball player should be compared to Michael Jordan, no band to the Beatles, no scientist to Albert Einstein, and no president to Abraham Lincoln. The Great Depression is in a class by itself, the likes of which I don’t think we’ll ever see again. I’m glad we got that out of the way.